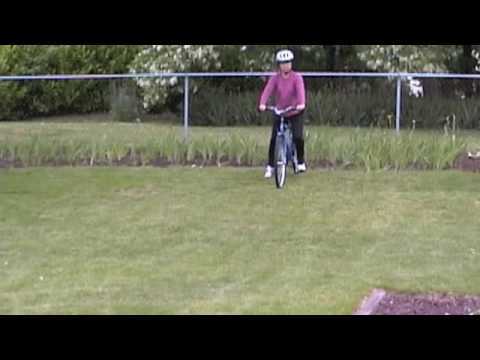 Best Answer: Here's just one of many videos that can teach you how to ride a bicycle. Dang...please be more vague. Don't know if you're trying to ask how to balance or something else. Bike where? How? Yahoo provides LOTS of room under "additional details" to further elaborate. But NOOOOO...you couldn't do that. You sit on the seat, put your feet on the pedals and move them around in a circular motion. It's easy once you get used to balancing. Can bikes have review mirrors? How can biking help you lose weight? Can bikes run red lights legally? Can a bike have a gender? Can biking improve running? Can it improve soccer/football? What is a good E.D. treatment that makes my crank really hard, and where do i buy it? How good is a Shimano HG-200, 11-32, 9-speed hub on a bicycle?